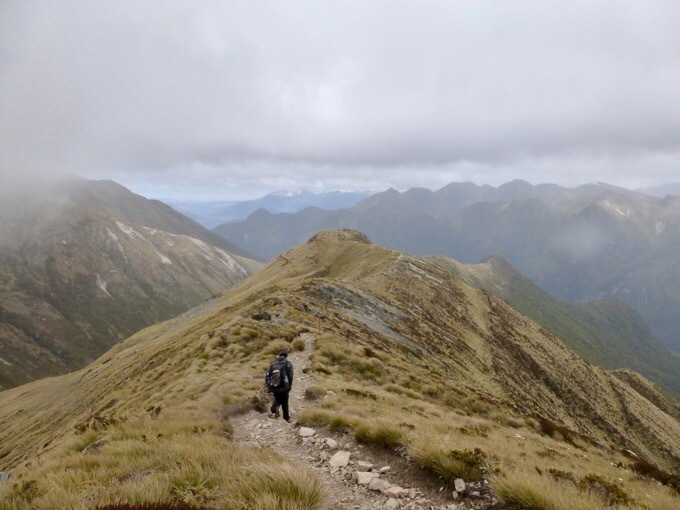 Day 104: Kepler Track, Definitely A GREAT Walk! We had another great breakfast at the B&B. After 2.5 days of not hiking, my appetite is already going down and I was sad I couldn’t eat more of the wide range of food they had at the B&B. In regular life, I’m not usually hungry enough to eat a big breakfast, so it’s something I enjoy when I’m hiking and my body wants to eat more. Fortunately, my body self-regulates pretty quickly. If I’m not active for a couple days, my stomach immediately wants less food. Bummer this morning as I couldn’t finish all that I had grabbed. 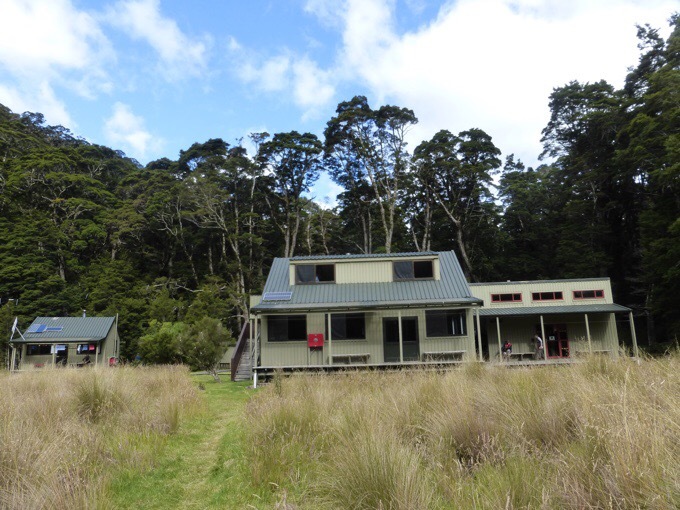 The Lakefront B&B in Te Anau gets a huge recommendation from us! They had so much awesome food, even providing homemade muffins, fruit, and baked goods during the day. The beds were super comfy and the rooms were nice. They kindly printed out something I needed printed and even offered up the use of their personal laptop if I needed. Then, as if all that wasn’t enough, they were busy making breakfast when we left this morning, so they gave us their car for the less than 10min drive to the trailhead and said they’d come pick it up later today. Wow! 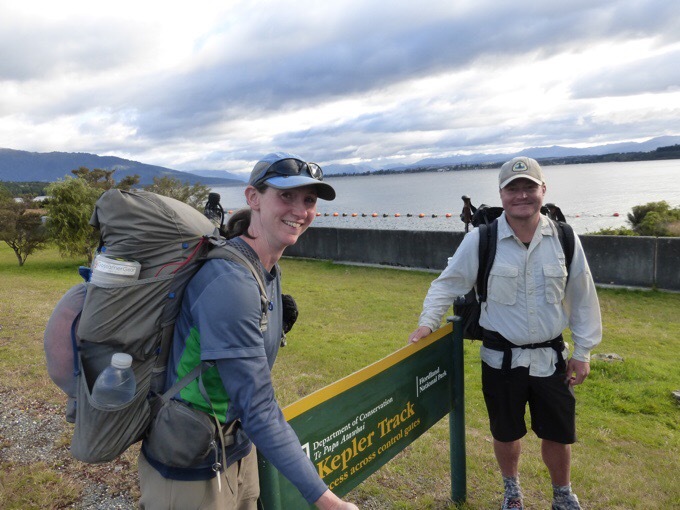 Then, on top of that, even though we aren’t staying in Te Anau tomorrow night, they offered to pick us up at the trailhead when we finish the trail tomorrow afternoon. Unbelievable! 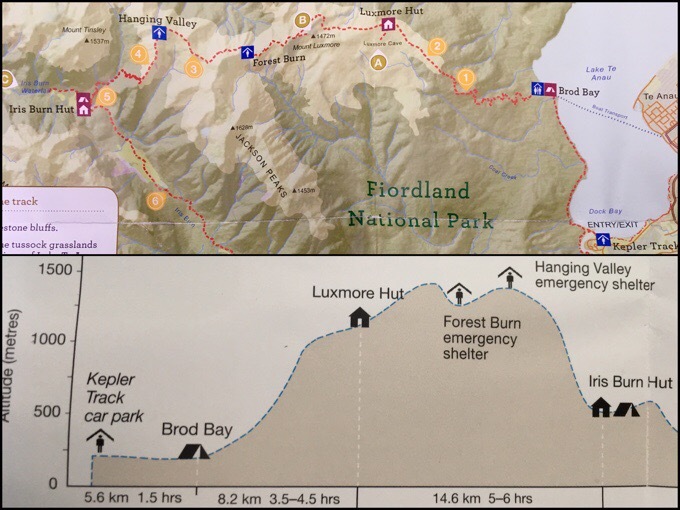 We started the Kepler Track from the main parking lot and are doing the 37mi/60km circuit track over two days in the counterclockwise direction. 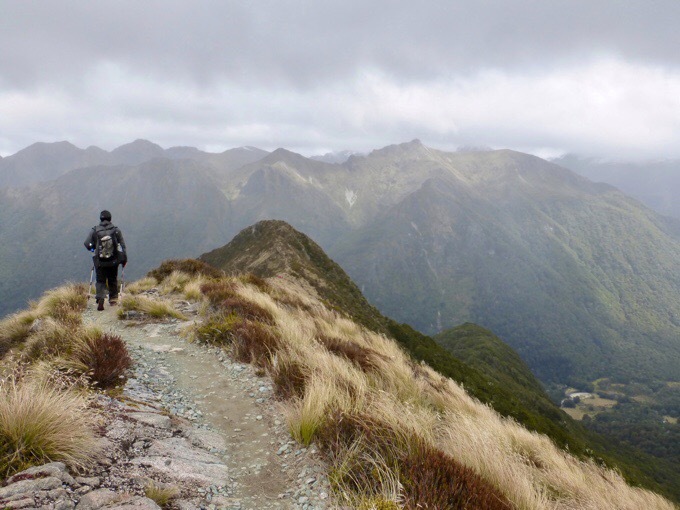 The Kepler Track is one of New Zealand’s 9 Great Walks, so you need to book huts and campsites well in advance. We were surprised when we were able to nab two spots at a campground on the track just four days before. 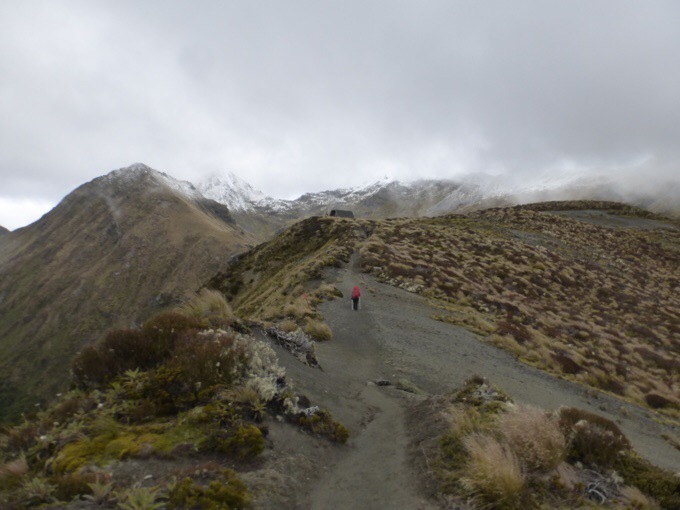 We heard that if it is booked up, those that can do big mile days can do a 27mi/44km day to land at a DOC hut (covered by the hut pass) that’s off a side trail after Moturau Hut. Fortunately, we don’t have to do that, and we were able to get the middle campsite, Iris Burn Campsite, so we get to do half the track today and half the track tomorrow at a relaxed pace. We started off in the woods for the first half of the day. 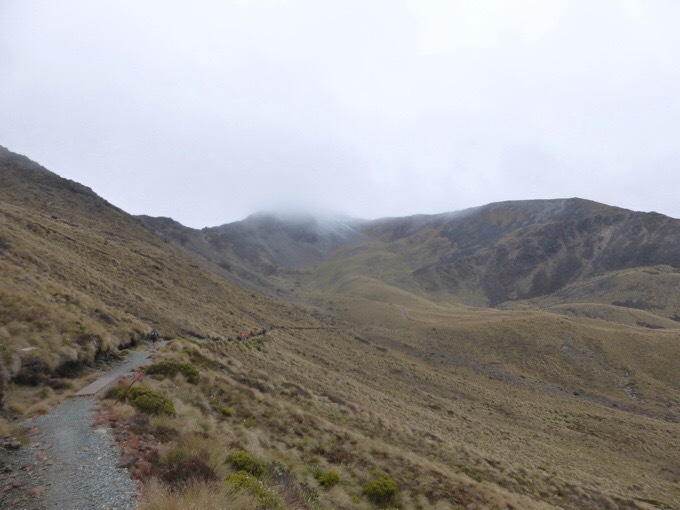 There were no lack of people on the trail as many were also day hiking up to the Luxmore Hut and back. 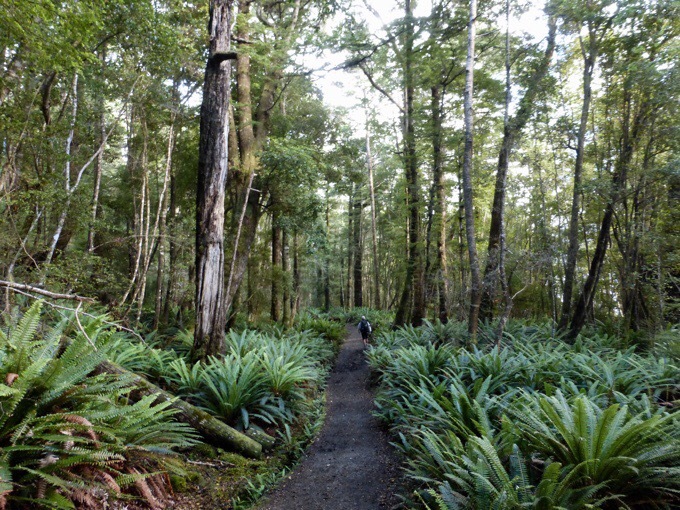 Since this is a Great Walk, it is super well maintained and has a nice wide trail to cruise. 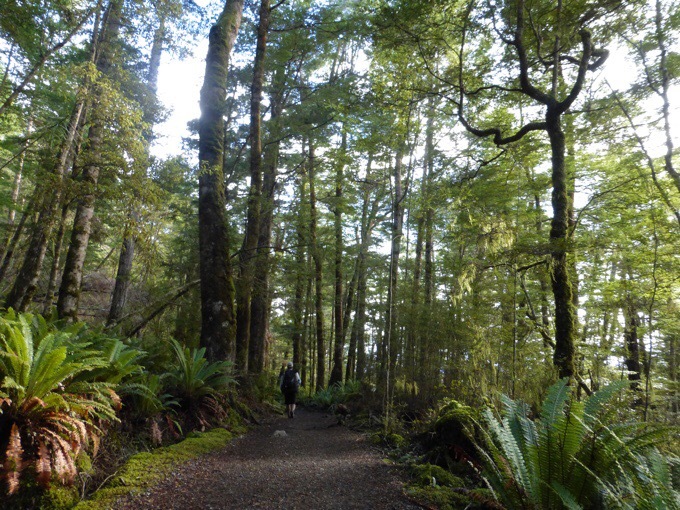 I really enjoy relaxing wooded hiking and was just happy to be out of tussock and on something I could stretch my legs on and relax. 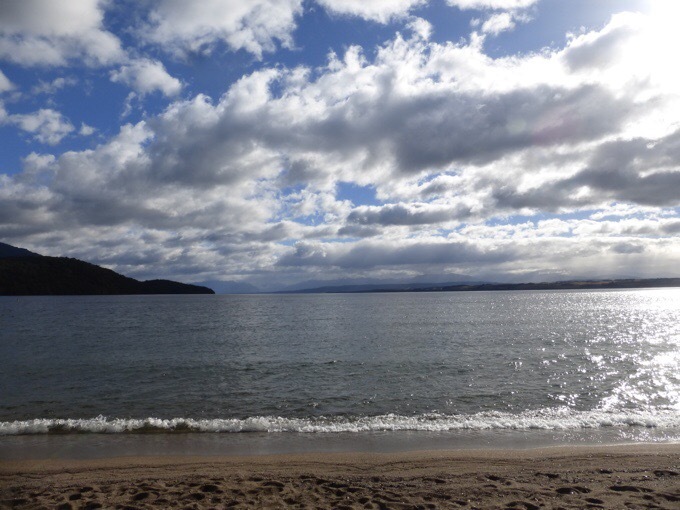 It was along Lake Te Anau, which could be heard and seen a bit through the trees, but never directly walked right along the lakefront. 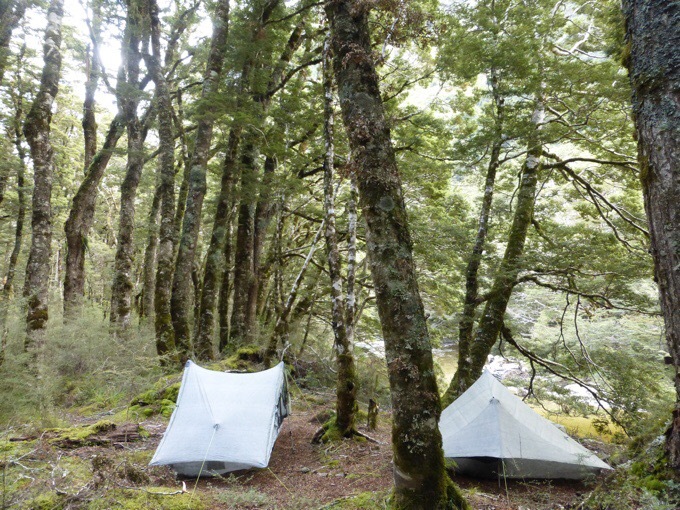 I took the time to also listen to my friend Buck-30’s old trail journal of his Tasmania trip back in 2010. I got my Tassie homework done for the day! 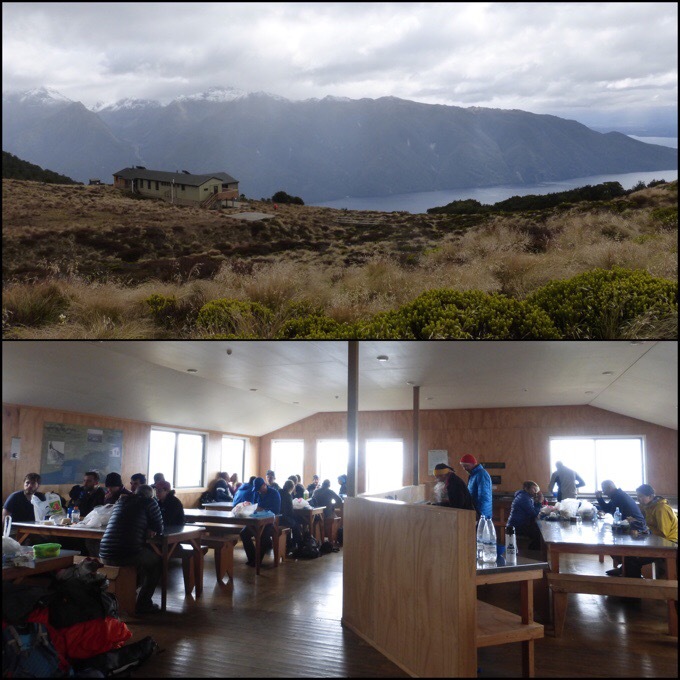 After awhile, the climbing began, and it continued until lunch at the large Luxmore Hut. 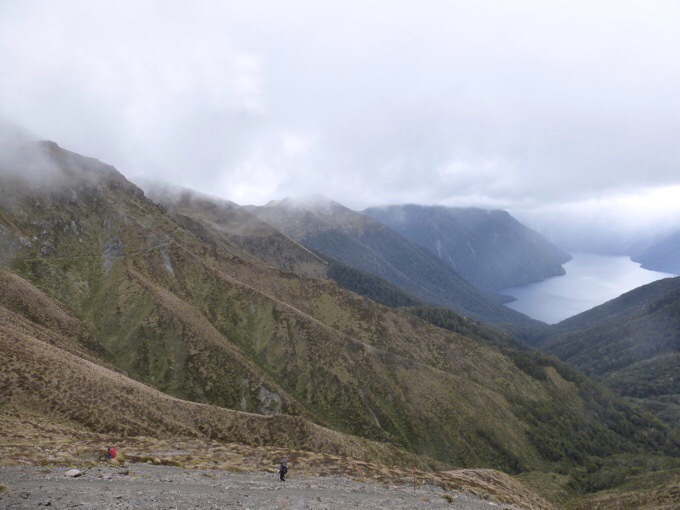 Before the hut, the trail breaks out of the trees with great views of the surrounding mountains and looking down on Lake Te Anau. It was a crisp fall-like day. Is summer already over? Did it ever even come to NZ at all this year? It was significantly colder out of the woods, and I was happy to have the hut to eat in, but it wasn’t warmed and my toes and fingers were numb by the time we got going again. 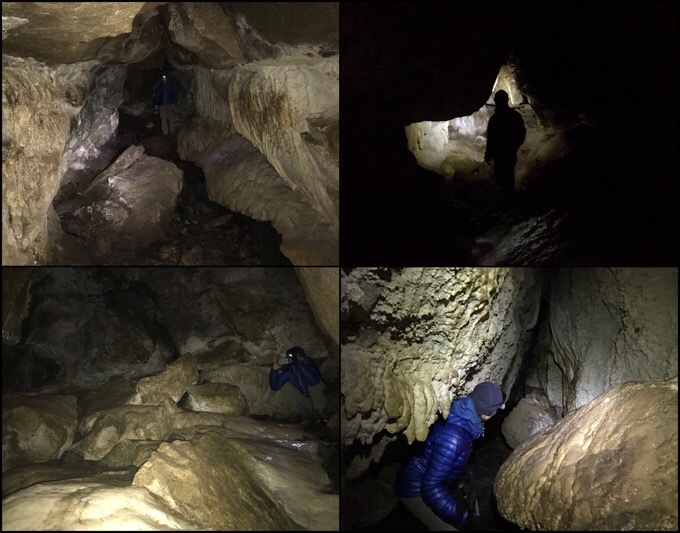 We did the short side trip to check out Luxmore Cave. We had it all to ourselves while we were there, and it was a good one. We went in a good 100m. 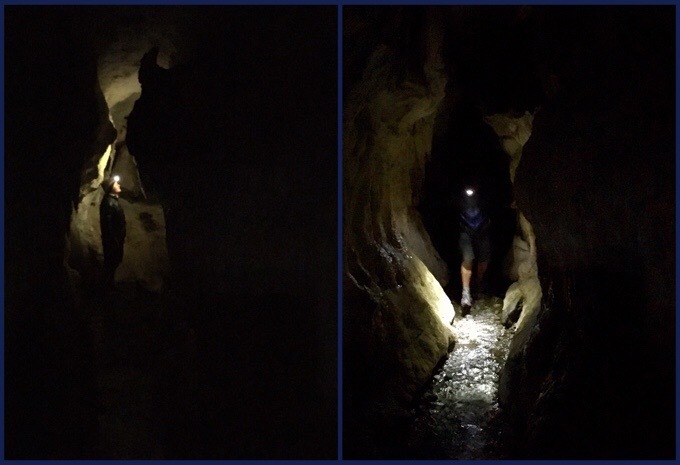 It had moments of tight spots we had to squeeze through or crouch down, and was pretty cool. 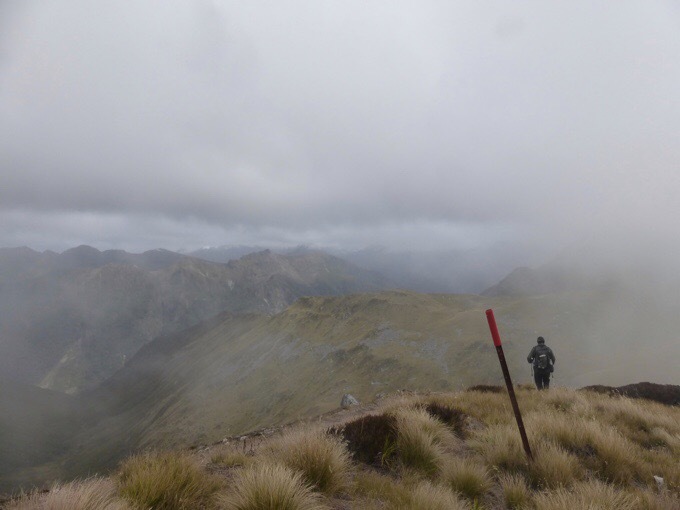 When we emerged, some fog and light rain was moving in. We put on the rain gear mostly for warmth. It was 40F/4.4C without the wind. The wind wasn’t bad, which it can be, so that was fortunate. 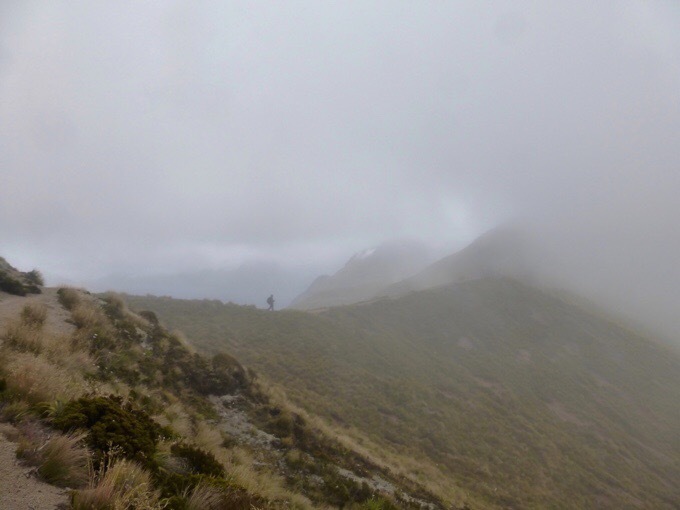 We had thought about doing the short side summit of Mt Luxmore, but the fog moved in enough to make it not worth it. As we continued along the exposed alpine section for the next few hours, we were treated to some awesome views! The fog rolled in and out giving it a mystical feel and revealing the scenery in all different ways. It was so much better than I’d anticipated and I’m really glad we decided to do this side trip. 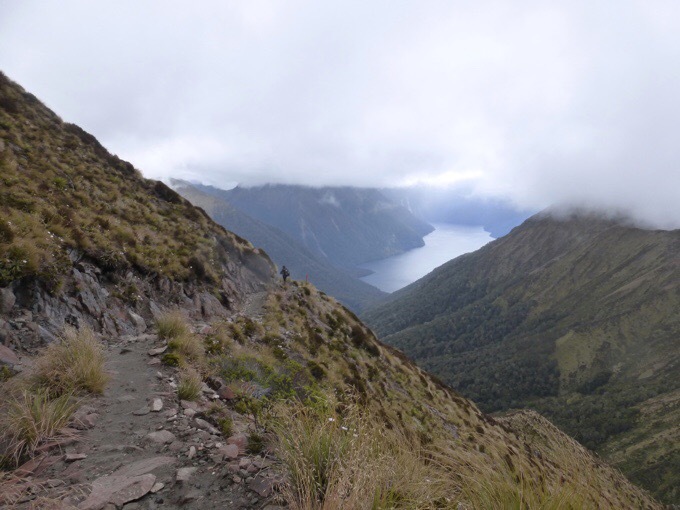 I like the counterclockwise direction we went and the way the views changed around each bend. It was great! 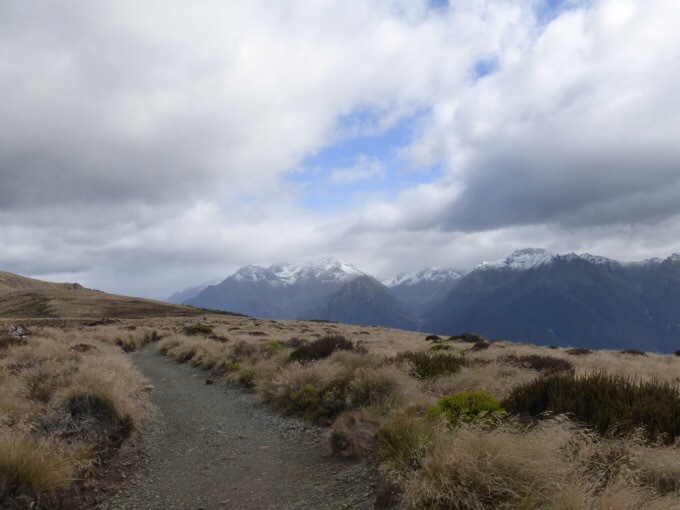 The last couple hours of the day, the trail dropped back down into the trees to Iris Burn Hut and campsite. The trail was nice gradual switchbacks that seemed to go on forever. 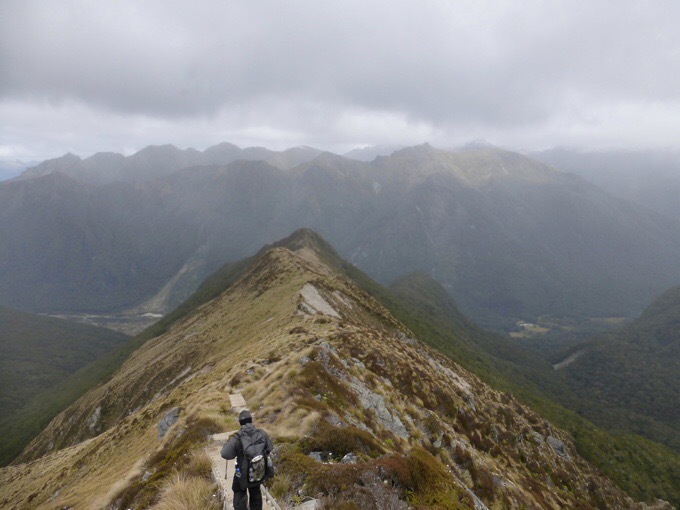 Before we dropped down, the final ridge walk was great. We got to the campsite just before 4:30pm, with plenty of time to setup and then check out the Iris Burn Falls on another short side hike. 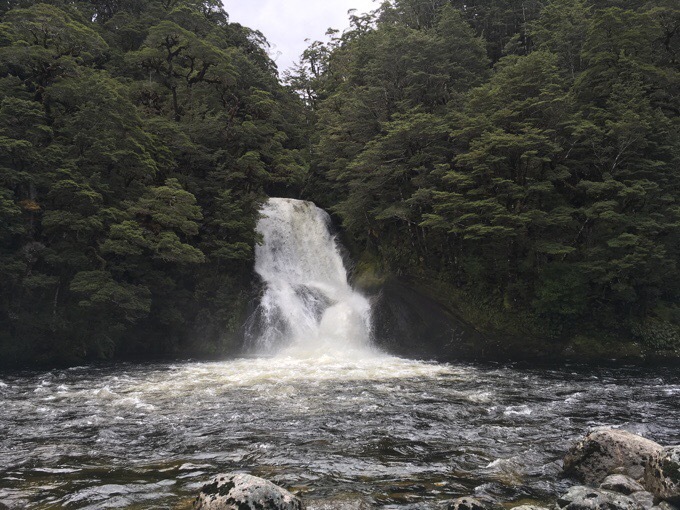 People comment that it’s worth the side hike, but after all the water we’ve seen on the TA and just seeing those huge falls in Milford Sound yesterday, it fell pretty flat for us. It was nice to settle into our tents early. We found a spot removed from the tightly packed main area, and had our own space quietly next to what I assume is the Iris Burn River. It wasn’t nearly as cold as we thought it might get since we were down low. Both of us found ourselves dozing off early around 8pm, once in our cozy sleeping bags. Another great day! Looks like another “perfect” day. Amazing views/great pics! Wahoo! I’m on a roll lately! 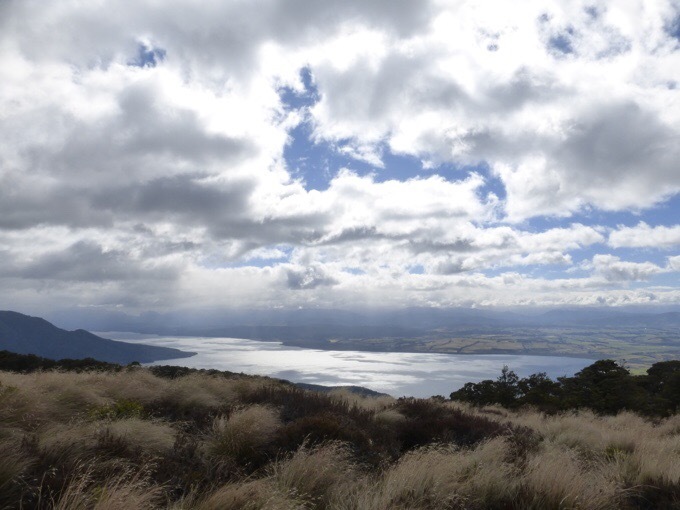 WOW….that was a beautiful day of hiking! This southern island is very tempting…..
Did I understand that right? You are getting a lift back from the trail, from people at a B&B when you are staying somewhere else?! Surely not! I know, right!? 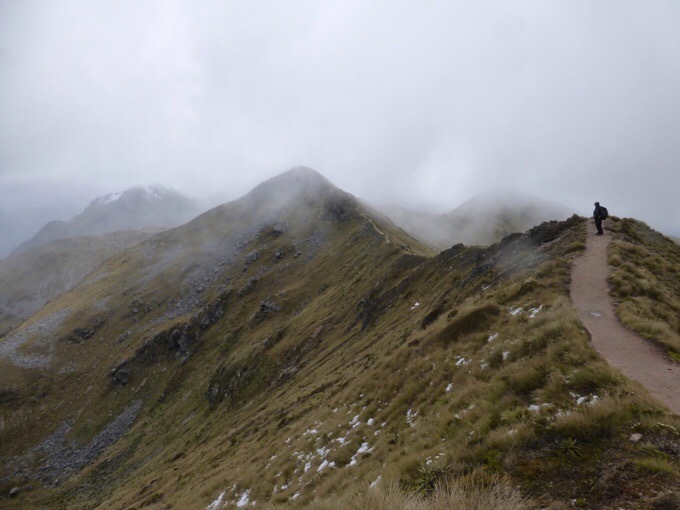 And maybe, just maybe the Pyrenees could be my next hike! Ridge walk looked fun. Glad you had yet another good day!